Product page SEO is not just about SEO. As weird as this may sound, when doing SEO for ecommerce product pages, you need to take into account other factors that go beyond traditional SEO practices. A product page that offers a great experience for the users will not only rank higher but it will also generate more sales and conversions. Your overall goal is to create a product page that is user-friendly, optimized for conversions but at the same time SEO friendly and easy to crawl by search engines. The first element that needs your attention is the product URL. Although it’s not the most important ranking factor, having properly optimized product URLS is recommended for a number of reasons. 3rd – It’s good for readability purposes especially in cases when you (or someone else) posts a URL of your products in a forum or a comment. How do you optimize your product URLS? Everything that is recommended for an SEO friendly URL it’s also applicable for product URLs, with some variations that are specific for ecommerce websites. Avoid using stop words like “a,” “an,” and “the.”, in the URL. Include attributes and product characteristics like the brand name or colour. If you do have to include extra characters that are maybe needed by your CMS, try to have those at the end. And an example of a non-optimized product URL from Amazon! If you are wondering why Amazon doesn’t optimize their URLS, the answer is simple. First, they don’t have to do it because SEO optimization is not their priority and second, they have a huge website with millions of products and it might be technically impossible for them to do this change. With that being said, if you have a lot of products or it’s too difficult to change them, don’t spend time with optimizing the URLS, there are more important changes to do to your shop (as you will read below). If you are up to the job, then make sure that for each product page you change the URL, you add a 301 Redirection so that the old URL is redirected to the new URL. Read my previous article on how to redesign a website without losing SEO for more details on how to do the redirections. The next step is to work on your product titles. This is one of the important optimization tasks you can do for your product pages. 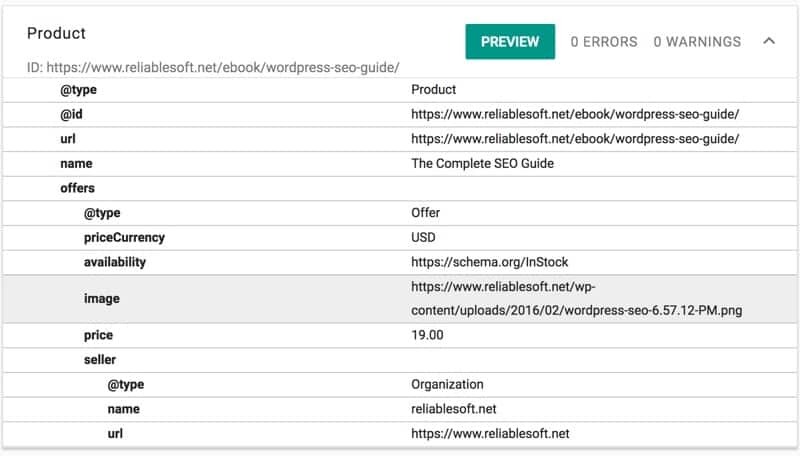 In my SEO Tutorial, I have added several examples on how to SEO the titles of your blog posts or pages and while these are valid, when it comes to ecommerce SEO you need to take into account a few other things. To be more precise, your titles should combine details about the product and keywords that people use in searching for the particular product, in 60 characters or less. Why 60 characters or less? Because this is what is shown on average in the search snippets, without breaking your title. See the two examples below. The first one is 60 characters (excluding the site name) and it shows as is, while the second one is more than 60 characters so Google breaks it up. Important Note: You don’t need to repeat your domain name in the product title, Google does this automatically. How do you combine product names and keywords in the title? Let’s see some examples to understand how to have both your product names and keywords in the same title. The first step is to refer to the results of your keyword research. Having a clear idea on what people type in the Google search box is important. Let’s say that you are selling shoes and you know from the keyword research that people search for “men’s running shoes”. Your first action is to optimize your category page for that term. It’s a general term and a great candidate for category optimization. Notice the format of the title which includes the brand name, model and keywords i.e. Men’s Running Shoe or Racer Women’s Shoe. Pro Tip: If you are selling products that the brand name is not so important, you can change the order of the words in the title to include the keywords first and then the brand or type. For example, look at this product title from Etsy. The keyword “boyfriend gift” is at the beginning of the title and this makes the title more optimized. Last but certainly not least, don’t forget that each and every product page of your ecommerce website needs to have a <title> and this has to be unique across your site. It is very common for the H1 tag of the page to be the same as the title. While this is ok (and the default configuration for many CMS), if you want you can change it to be friendlier for users (since you can safely use more characters) and also, it’s another opportunity to enrich your page with related keywords. Besides that, the other thing to check and ensure is that your page has only one H1 tag and this is located high in the page and above the other headings (h2, h3, etc). 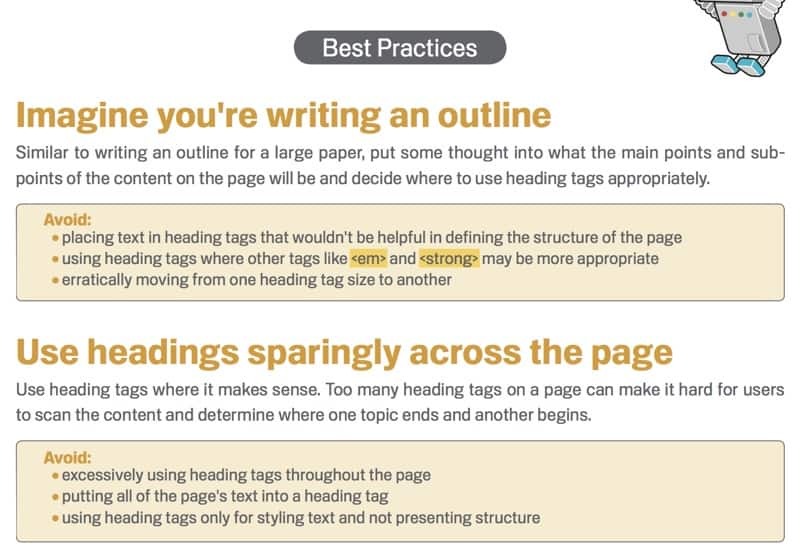 When it comes to other headings (h2, h2, etc), use them according to best practices. Provide a unique description for each and every page of your website, and that includes product pages. Write descriptions that accurately describe the page content in 160 characters or less. If you don’t provide for a meta description that meets the above guidelines, Google will pick up text from the page and show it as a meta description. The problem is that on many occasions the text shown by Google as description is not interesting for the users and thus you loose clicks (and potential customers). So, it’s better to take advantage of meta descriptions and make your search snippets interesting and inviting for the users to click and visit your product pages. What to include in your product meta description? A description needs to include the product name and keywords. As you can see in the examples below, Google highlights the words from a description that matches the user’s query. Other than that, you can add benefits like free shipping and returns, money back guarantee and other information that can differentiate your snippet entry from the rest. The snippet from Amazon below, is a very good example of an optimized meta description. 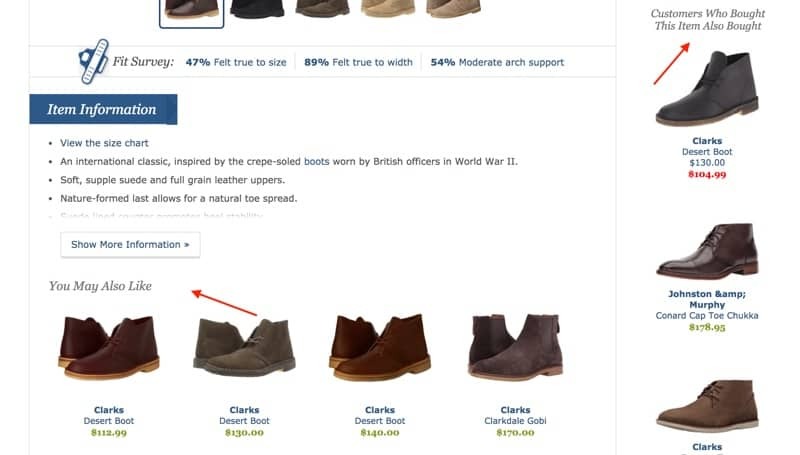 In my ecommerce site structure article, I have explained why breadcrumb menus are important for user friendliness and the usability aspect of an ecommerce website. What is necessary to highlight again is that besides making your website user friendly and SEO friendly, breadcrumbs can contribute in higher CTRs (click through rates), because they enhance the presentation of your snippet in the SERPS. To take advantage of this, breadcrumbs need to have the proper structure data (schema) so that they can be understood by Google. Look at the example below and see how Google is using the breadcrumb information in the snippet (for both desktop and mobile), instead of showing the product URL. It’s more relevant and can contribute to better CTRs. Optimizing your product description is one of the most difficult and time-consuming tasks, especially if you have a lot of products in your ecommerce store. From experience, it’s also one of the tasks that most ecommerce owners get it wrong. Let’s see what we mean by product description optimization. Google is looking for unique, high quality content to show in the search results from high quality websites. If your product description is an exact copy of what is already available in other ecommerce websites on the Internet, that have a higher domain authority and Google trust, it will simply ignore your product pages. Google does not penalize websites because of duplicate content but it does not reward them either. 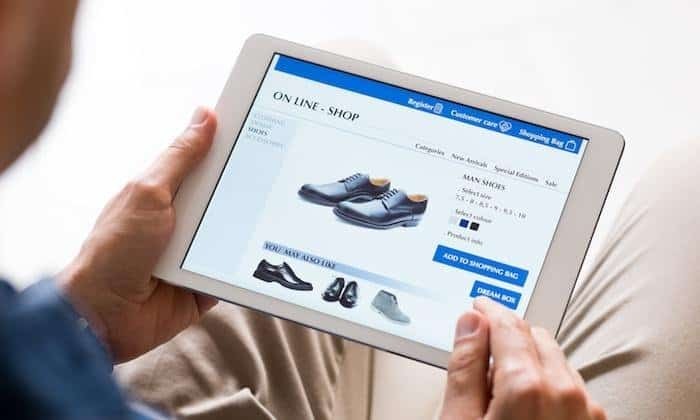 An ecommerce website that has a lot of pages with duplicate content is considered as a low-quality website and the chances of ranking high for competitive terms is minimum to none. So, the first thing that you need to do is to ensure that your product page description is unique. Uniqueness is not limited to websites across the web but to your own website too. In other words, each and every product of your shop needs to have a unique description and not the same description as another product within your shop. There is no golden rule as to the number of words your product description should be, but it is proven that long form content ranks higher in Google, and is shared more frequently in social media. Of course, your goal with ecommerce websites is to make sales so your product descriptions should primarily serve that purpose. The added advantage of providing for long descriptions is that with the proper SEO techniques, you will have the opportunity to blend keywords into your text and make your product pages both search engine friendly and interesting for the users. Look at any product on Amazon, they have a ton of content related to product usage, product short and long description, customer reviews, Q & A related to the product and a lot of other useful information. 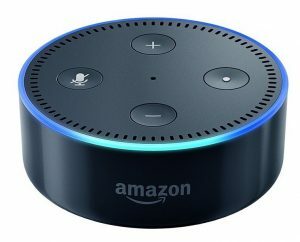 Amazon is not doing this for SEO purposes, but because it helps users into making a purchase decision. Many ecommerce owners worry that having too much content on the page will break the design but that’s not the case. You can follow the same pattern as amazon, i.e. have a short description above the fold and a long description below the page. Almost all modern ecommerce CMS (woocommerce, shopify etc), have this kind of functionality build in into their systems. While writing your product descriptions don’t forget about optimizing your content. The best way to do this is to go back to the results of your keyword research and make a list of keywords that are related to the specific product. Use those keywords in your headings and text naturally without doing keyword stuffing. Mentioning your target keyword a 3-5 times in the text is enough and using related keywords from your list in the headings will help Google understand what the page is all about. You can link to related products within the text but be wise, you don’t want to drive people away from your product page. Your goal is to keep them as much as possible on the page so that they eventually take the next step, which is to proceed with a purchase. Pro Hint: Examine the bounce rate of your pages by looking at your Google analytics reports. Product pages that have a high bounce rate are good candidates for improving their content further. Images are necessary components of your product pages. Regardless of the type of products you are selling, your product pages must have images. Avoid the use of bad stock images – using images that are not of good quality can drive customers away. If you cannot create original images of your products then make sure that you select high quality images that look real and authentic. Pro Tip: Using the real photo of you or your team can increase trust in the cases that you are selling services or intangible products. It’ easier for you to manage the (possibly) hundreds of images in your store. When other websites use a URL to one of your images, it will be meaningful. You increase your changes of ranking in Google image search. Try to use keywords in a natural manner in your image filenames. Optimize your ALT Text – ALT TEXT (or alternative text) is one of the most important elements of image optimization. It is important for SEO since it’s through the ALT text that search engines can understand what an image is all about. Use a short caption below each image to give search engines and users more information for the image (see example C above). The size of the images does matter. Smaller images are faster to download while large images may slow a website down. Before uploading your images make sure that you optimize their size. If the largest image size you need is 1200×650, don’t upload images that are bigger than that size (even though they will be automatically resized by your CMS). Use tools like image optim to optimize their size without sacrificing quality. If you have a lot of product images, consider using a CDN so that images are delivered by a network of servers and not from your server. Where possible, try to use Videos to make your product content more interesting. People love videos and good original videos can differentiate your shop from competitors and increase conversions. You can use videos from the product manufacturers (if available) but the best approach would be to create your own videos. Do not upload videos directly on your server, instead use a dedicated video hosting service like youtube or vimeo. Once uploaded, there are various way to embed the videos in your product pages. Create a video sitemap and submit to Google. In simple terms, product schema or structured data is a way to highlight certain data items from your product pages (such as name of the product, price, availability, reviews and ratings), so that search engines can read and understand this information easier. By highlighting, we mean adding specific lines of code to your pages that provide this information to search engine crawlers. It’s a great way to help search engines understand more about your product. It’s another way to enhance your snippet in the SERPS and get higher CTR (click through rates). When product schema is configured correctly, your search snippet will include the price of the item, reviews and stock information as shown in the example above. How to add product schema? It depends on the ecommerce platform you are using. Most modern ecommerce CMS (like Shopify or Woocommerce) have product schema built in. Notice that it shows no errors or warnings on the top right. 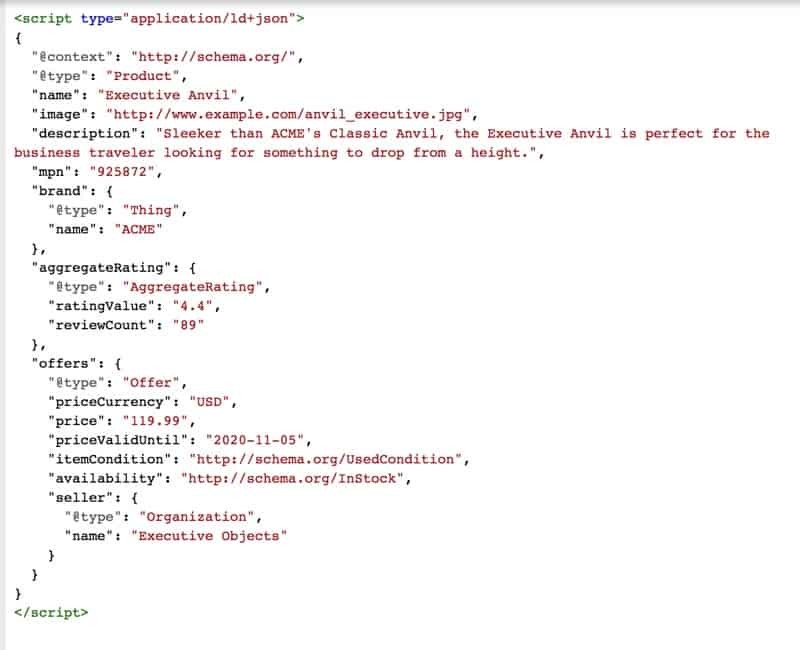 If your product pages are missing structured data, then the best way to add them is to use the JSON-LD format. Now, this is a part that may require more reading and it needs technical knowledge. If you don’t feel comfortable messing with code then it is highly recommended to hire a developer to do this for you. Pro Tip: Structured data information is heavily used by Voice Search Systems (like Google Assistant) and this is another good reason why you need to have your product pages configured correctly. Open graph meta tags are similar to product markup. They are used so that any information shared to social networks is accurate. When visitors click a LIKE or SHARE button to publish your page in social media networks, you want to have the correct picture and information shared and this is achieved by having the right open graph tags defined. Note: Open Graph meta tags will not help you with SEO as they don’t have any direct or indirect effect on rankings but they are important for the proper representation of your brand and products in social media. The good thing about open graph meta tags is that they are easy to implement. There are two main categories, open graph meta tags are used by Facebook, Instagram and Pinterest and Twitter Cards by twitter. The easiest way to make sure that they are configured correctly, is to install the free version of yoast seo plugin or social warfare plugins and configure the relevant settings. How to check open graph meta tags? To check that your implementation is correct, you can simply share one of your product pages on Facebook, Twitter, Pinterest and Instagram and monitor how it looks. Product reviews are among the ‘must-have’ components of successful product pages. It is statistically proven that users are more likely to convert if they see other people converting. Product pages with real, positive reviews are more likely to have higher conversion rates than product pages with no reviews. #1 – Add Star Ratings and total reviews below your product title. See the example of Amazon below. When clicked it should go to the “Reviews” section at the bottom of the page. #2 – Make sure that your product reviews are in the same page as your products (don’t use a different review page for each product). #3 – Avoid having reviews in a tab that is not always visible. Google mentioned many times that they consider content in tabs (that are not active) less important than content in always-active tabs. #4 – Have latest reviews shown first. People like to read reviews that are valid for the product they are viewing and not for older products. #5 – Try to provide as much information as possible about the reviewer. If possible, have their real picture and name to accompany the review. Here is how I added the reviews on my SEO Course sales page. Visitors can read the review together with the image and name of the person. They can also click on the link to see where the review was posted. #6 – Don’t make the mistake of adding reviews without proof. Fake reviews can be easily spotted by users and this can generate the opposite results. In order to take advantage of product reviews and improve your presence in Search (or AdWords Ads), you need to have product review schema implemented. Product reviews structured data works in exactly the same way as product schema i.e. you add certain tags in your html code to help search engine crawlers extract review information. I have mentioned above that you need to make every effort to make your reviews look real. One of the best ways to achieve this is to make use of a third-party review system. Reviews posted publicity on third party sites are more trusted by user (and Google) because they cannot be manipulated. Depending on your business, there are review systems dedicated for specific kind of products. Here is a list of the most popular review systems you can use. 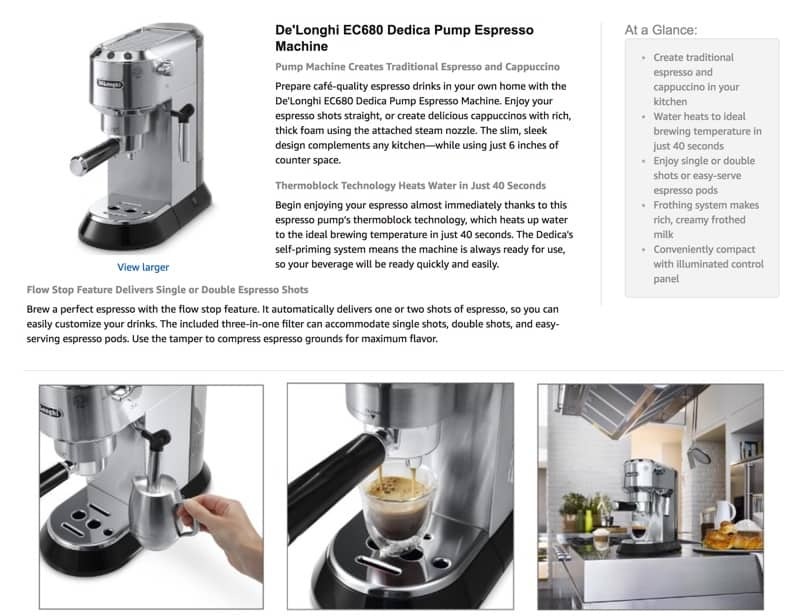 One of the ways to have more unique content on your product pages is “user generated content”. User generated content is what the name implies i.e. content generated by users, usually in the form of questions and answers. 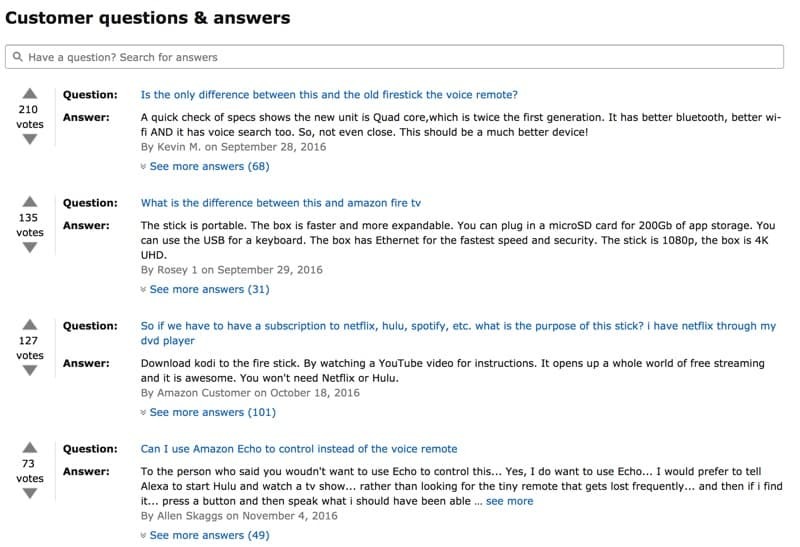 Amazon does a great job in this, below each of product descriptions you will see a section called “Customer questions and answers”. There are a few things to note about user generating content from an SEO perspective. Make sure that you nofollow any links in the answers or better disallow users from entering links (allow only text). The last thing you want is for spammers to fill out your pages with spammy content and links. Monitor all replies before publishing. Publish only questions and answers that are highly relevant to your product. Don’t fill your page with Q&A content. Show 4 or 5 questions and then for more questions redirect the user to a dedicated page (or to a hidden tab). “User Generated Content” is not always easy to achieve, you need to have popular products and a system in place to email existing customers questions your potential customers have. Nevertheless, if you can have this feature it will be helpful for your SEO and customer support. Giving users cross selling options besides assisting in generating more sales, it’s also a great way to add internal links for your product pages. If you go to any popular online store, you will notice that below each product they have sections displaying matching products or what other people have purchased that is related to the viewed product. Product page SEO is not as difficult as it sounds and as mentioned in the introduction, it’s not just about SEO. This is nice SEO guide. I think not only for e-commerce website but it also apply to any SEO site to rank higher in Google. Great information here, it’s a must read. Alex this is spot on. I think ecommerce sites get hurt by simple stuff that you talk about in this post because alot of ecom platforms are pretty hard to work on… so finding an expert to help you with implementation can definitely pay off! Previously I was a little confused about how I should optimise eCommerce website. Thank you ALex now I know actually how I should optimise this kind of sites. This will help me a lot. All great points Alex! I think one of the most important aspect of SEO for e-commerce pages like you mentioned is usability. All keywords and rankings aside, if users clicking around a site trying to buy a product can’t even view the product or have issues reading it’s description and end up leaving, then all of the other SEO work was done for nothing. Awesome post, very detailed information. Thanks for sharing it with us Alex.